Reading manager Brian McDermott says he will need more time to address a shortage of league goals from his side. The Royals have failed to score more than once in a Championship game since 21 November - five games before McDermott took charge of the club. Reading sit 15th in the table as they prepare to host third-placed Burnley at the Madejski Stadium on Saturday. "Let's have some time and let's let us get to where we need to get to," McDermott told BBC Radio Berkshire. Conversely, Reading have scored 11 goals in three FA Cup games - including a third-round replay against Huddersfield which they won 5-2 - on the way to booking a fifth-round tie with Premier League side West Bromwich Albion. 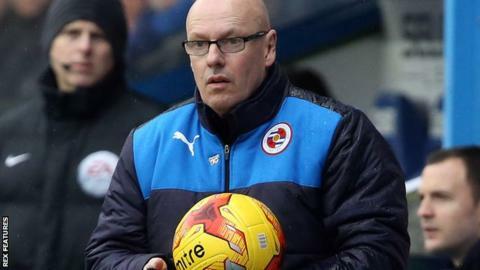 McDermott has overseen four wins, four draws and four defeats in all competitions since returning to Reading for a second spell as manager in December. The club have slipped 14 points behind the play-off positions after just one league win in six games. "We're just trying to find a solution to something that's been going on for not 12 games, not one season, but for longer than that," McDermott added. "We're trying to build a team and we're trying to get something going. When we do that, we will be scoring more goals. "I've had 12 games in a really congested period of time, with a transfer window amongst it." McDermott confirmed midfielder Aaron Tshibola could miss the remainder of the season following surgery on a hamstring injury. Fellow midfielder George Evans is in contention for the squad to face Burnley, having played just 65 minutes since his January move from Manchester City.